GAO-10-847T: Published: Jul 22, 2010. Publicly Released: Jul 22, 2010. 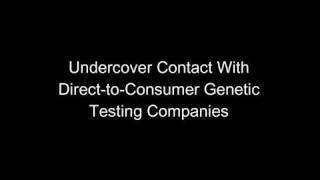 Examples of deceptive or dangerous marketing used by genetic testing companies, obtained by GAO through undercover contact and telephone calls. In 2006, GAO investigated companies selling direct-to-consumer (DTC) genetic tests and testified that these companies made medically unproven disease predictions. Although new companies have since been touted as being more reputable--Time named one company's test 2008's "invention of the year"--experts remain concerned that the test results mislead consumers. GAO was asked to investigate DTC genetic tests currently on the market and the advertising methods used to sell these tests. GAO purchased 10 tests each from four companies, for $299 to $999 per test. GAO then selected five donors and sent two DNA samples from each donor to each company: one using factual information about the donor and one using fictitious information, such as incorrect age and race or ethnicity. After comparing risk predictions that the donors received for 15 diseases, GAO made undercover calls to the companies seeking health advice. GAO did not conduct a scientific study but instead documented observations that could be made by any consumer. To assess whether the tests provided any medically useful information, GAO consulted with genetics experts. GAO also interviewed representatives from each company. To investigate advertising methods, GAO made undercover contact with 15 DTC companies, including the 4 tested, and asked about supplement sales, test reliability, and privacy policies. GAO again consulted with experts about the veracity of the claims. GAO's fictitious consumers received test results that are misleading and of little or no practical use. For example, GAO's donors often received disease risk predictions that varied across the four companies, indicating that identical DNA samples yield contradictory results. One donor was told that he was at below-average, average, and above-average risk for prostate cancer and hypertension. GAO's donors also received DNA-based disease predictions that conflicted with their actual medical conditions--one donor who had a pacemaker implanted 13 years ago to treat an irregular heartbeat was told that he was at decreased risk for developing such a condition. Also, none of the companies could provide GAO's fictitious African American and Asian donors with complete test results, but did not explicitly disclose this limitation prior to purchase. Further, follow-up consultations offered by three of the companies failed to provide the expert advice that the companies promised. In post-test interviews with GAO, each of the companies claimed that its results were more accurate than the others'. Although the experts GAO spoke with believe that these tests show promise for the future, they agreed that consumers should not rely on any of the results at this time. As one expert said, "the fact that different companies, using the same samples, predict different directions of risk is telling and is important. It shows that we are nowhere near really being able to interpret [such tests]." GAO also found 10 egregious examples of deceptive marketing, including claims made by four companies that a consumer's DNA could be used to create personalized supplement to cure diseases. Two of these companies further stated that their supplements could "repair damaged DNA" or cure disease, even though experts confirmed there is no scientific basis for such claims. One company representative even fraudulently used endorsements from high-profile athletes to convince GAO's fictitious consumer to purchase such supplements. Two other companies asserted that they could predict in which sports children would excel based on DNA analysis, claims that an expert characterized as "complete garbage." Further, two companies told GAO's fictitious consumer that she could secretly test her fiance's DNA to "surprise" him with test results--though this practice is restricted in 33 states. Perhaps most disturbing, one company told a donor that an above average risk prediction for breast cancer meant she was "in the high risk of pretty much getting" the disease, a statement that experts found to be "horrifying" because it implies the test is diagnostic. To hear clips of undercover contacts, see http://www.gao.gov/products/GAO-10-847T. GAO has referred all the companies it investigated to the Food and Drug Administration and Federal Trade Commission for appropriate action.